OK, so on Ravelry I belong to a few groups. One of these is dedicated to the English Women's Weekly one of the few weekly magazines which still has a knitting pattern. They used to be awesome when Alan Dart was their resident toy designer and I have a very precious collection of dog-eared pages with out of print Alan Dart licensed toys such as Thomas the Tank engine and Mr Men collected from the magazine in the 80's and 90's. I mainly play along in here for a heads up on what is in each week's magazine hoping for similar chunks of knitting pattern gold. It's not happening as often these days though. The group moderator bettyboo, has recently decided to revamp the group to get some more lively chatter going and as she had never knitted a cowl (and they are the trendy winter accessory du jour) she proposed a Cowl KAL (Knit Along) for February. I was happy to jump in as the middle daughter, Mel, has a list of things for me to knit for Mel's and Louise's Awesome-tastic European adventure which is to take place at the end of this year. This is my first go at a organized KAL. It has been a comedy of errors from Day 1. So here I bring you the diary of a cowl (actually several cowls), complete with false starts, overly ambitious project plans, non-monogamous knitting and a master's degree in extreme frogging. First I had to choose a pattern: This is part of the fun anticipation of the countdown to the beginning of a KAL. You get to legitimately hunt through the stash of knitting books and magazines (and probably inwardly cringe slightly if you have as many and I do). You can trawl the patterns database on Ravelry for hours on end finding new delights. But you do eventually have to make a decision. I had three in my little stash of must knit patterns, all free patterns. The Lava Flow Cowl by Dixie Norton. This is knitted from a provisional cast on, twisted at the end to form a faux mobieus and then grafted together. Otherwise simple 2 by 2 rib and a single cable every 20 rows. Mel likes this one. The BFF Cowl by Ysolda Teague and tinyowlknits from Knitty Deep Fall Edition 2012. I loved this one when I first saw it when it went live in Knitty. I love the colours and the sentiment behind the design. I want to make this one for myself. These are also knitted from a provisional cast one and grafted at the end (so a similar skill set required to the Lava Flow Cowl above). Eleanor Cowl by Audrey Knight from Knitty Deep Fall 2010. This is lace knitted in the round. The second step is to find the right yarn. I'm being a good girl and am on a bit of a yarn diet at the moment (so no new yarn unless its for specific large project like a jumper or cardigan) and op shop yarn does not count. So I got to commune with the stash and find some likely yarn. Imagine me shoulder deep in the stash boxes, gently squishing yarn for suitability and carrying on a gentle voiced conversation with the rejected yarn to make sure its feelings weren't hurt in the process. Disgruntled yarn makes for a feral stash. So I eventually choose two lots of yarn, one for the Lava Flow Cowl and two different colours for the BFF Cowl. OK, So I admit it, I cast on two days early! The 30th of January I couldn't hack it any more and I cast on for the Lava Flow Cowl. The yarn I chose for this is a op shop find. It is a multi-plyed wool in a creamy brownish colour. I had about 10 roughly 50 gram balls of this originally and it cost me 50 cents at an op shop closing down sale. This is the same yarn as I knitted Mel's Owlishly Warm mitts from and so I know it blooms up beautifully soft after a bath. And matching colour accessories makes sense. I used some waste yarn to crochet a chain for a provisional cast on. I picked up the required number of stitches from the chain (with difficulty) and then re-read the pattern notes and realised I should have been picking up from the purl bumps on the back. So I pulled it out and started again. So this how far I got after an evening knitting. I was using 4.5 mm needles as suggested by the pattern. I was using a thickish yarn of around the right weight. I was happy with the yarn and how the pattern was coming up but it didn't seem to be quite wide enough. The pattern was vague about required gauge just stating 4.5 stitches to the inch. I sort of had that (if I stretched out the rib). But it looked like it was going to turn out two short if this was 1 and three quarters of a repeat.... Hmm... Solution, put it aside and re-think. Day 1 (1st February 2013): I was thinking about what to do with the Lava Flow cowl and so decided to cast on for the BFF cowl instead. Started with 4.5 mm needles as suggested by the pattern and completed one full pattern repeat of the cocoon stitch cowl. I am using yarn from the stash that my mother bought me after a trip to the Australian Country Spinner's Woollen mill (the home of Cleckheaton, Patons, Shepherd and Panda Yarns in Australia). The wool is unlabelled seconds in a rough long ball and appears to be basically DK/8ply so it doesn’t meet gauge. Need to frog and redo with larger needles. Oh, and I had a copy of the pattern I dowloaded on the first day it went live and it had errors…. Fixed by getting my boy who was sitting next to me to drag up the the pattern from the Knitty site and change screens from 9GAG whenever I needed to look at it. Bonding time with teenage boy also achieved. Day 2: Used the lime green yarn and 5.5mm needles and knit up an tension square. Made gauge roughly. Frogged the tension square and the bit of the blue cocoon cowl link I had done. Redid the crochet provisional cast on with a larger hook. Began knitting again did 2 full pattern repeats + 4 rows of the third. Now using my daughter’s metallic purple knitting needles. Day 3: Lots of car knitting. Moving day for future doctor daughter. Knitted while she drove us to her new house. Knitted while watching TV at night. 8 repeats finished. Just over half way on this loop. A bit worried about how much yarn I have left…. That’s what comes of using a random ball of seconds. Have no idea even how much it weighs. Day 4: Knitted in the evening while watching MasterChef The Professionals. Have completed 11 full repeats and two rows of the twelfth repeat AND RUN OUT OF YARN. It’s not long enough. I can’t quite decide if I should be ironic now and finish the two repeats I have left to go it a wildly contrasting colour… Or frog it and begin again with new yarn. Day 5: Tried adding a few rows with a contrasting colour (a deep teal). Just looked weird. So I frogged the lot! 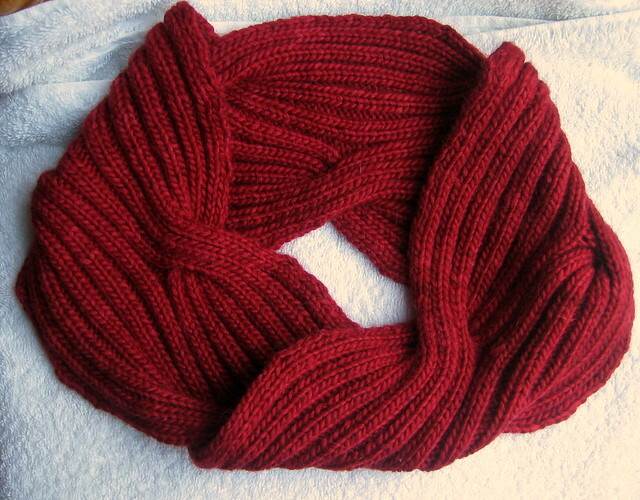 (I had fun knitting it in the first place and it will be fun to knit again). But I need a major re-think on what yarn I am going to use... (I may have to buy some). Day 6: OK I am Back to the original Lava Flow cowl. Began by frogging the lot (You can see why this KAL deserves the awarding of at least a master's degree in extreme frogging) and went up to 5.5 mm needles to make it a little larger. Went with my little sister to Melbourne today so 5 hours combined, train and bus knitting time. Redid crochet provisional cast on on a larger hook. Knitted till I ran out wool on the first ball. 4 full repeats nearly. Much better size this time. This is now going to be called the Buses and Trains Cowl. (I figure Mel will wear it on lots of buses and trains in Europe too). Day 7: Did a few rows in the evening. Joined on new ball of yarn. Nearly up to 5th Cable row. Happy with how this is turning out now. Dodgy photo of progress though. Day 8 and 9: More evening and afternoon knitting interspersed with marking of exam papers. Now up to 8 repeats and just finished the 2nd ball of yarn. Going swimmingly. This is just the first installment of my Cowl KAL diary. Stay tuned for more to come. Will she finish the Buses and Trains Cowl soon? Will she re-start the BFF cowl for the third time?